WHO 37 - A Doctor Who Podcast: Chicago TARDIS: A shadow of my past and of your future! Chicago TARDIS: A shadow of my past and of your future! In less than four months, an amazing, celebratory event will take place. And no, I'm not talking about the 50th anniversary special (although that, too, will hopefully be amazing and celebratory)! 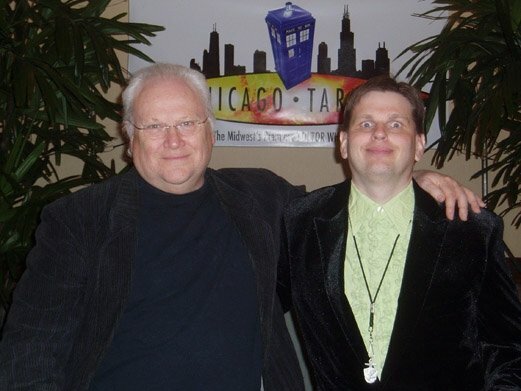 No, I'm talking about Chicago TARDIS, the annual Doctor Who convention held at the outskirts of Chicago every Thanksgiving weekend. And this year is shaping out to be the biggest celebration of Doctor Who ever in the Chicago area since the 20th Anniversary convention. This will be my sixth attendance of the con. My first time was way back in 2004, and I remember the 10 hour drive thru blizzard conditions from St. Clair County Illinois to Chicago (usually a 5 hour drive) to make it up for the weekend. I only was at the con for Friday as I was spending the remaining weekend with my girlfriend. 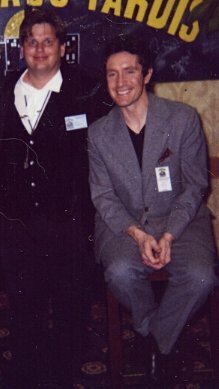 I don't remember much from that day, but I did have my first brief meet & greet with one of the Doctors - in this instance, Paul McGann. The following year I was a Chicago resident and was able to make the weekend. Again, memories of that time are distant, but the one distinct memory I have was waiting in line in the hallway for photos with Peter Davison & Nicola Bryant, and at one point Peter came out of the room and ran down the hallway for some reason. A few minutes later, someone came by and asked where Peter went, and another person said that he ran down the corridor, and I joked that "some things never change", which got a few giggles. 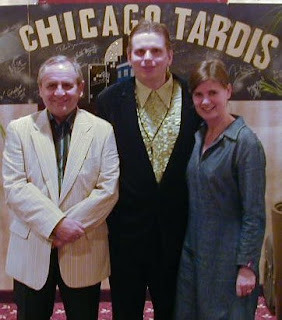 The next year Sylvester McCoy & Sophie Aldred were the guests of honor. 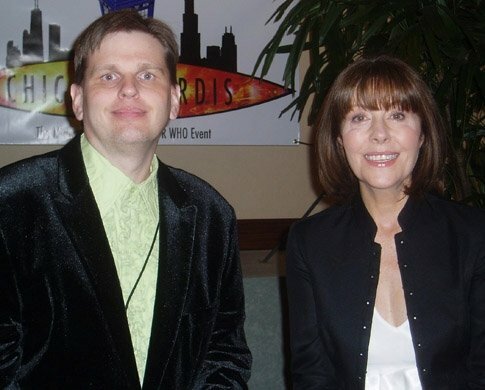 Highlights included a live commentary of "Survival" (with one of Sophie's sons joining in), Sylvester wandering the audience with his wireless mic answering questions, and of course, Mysterious Theater 337.
and, what would prove to be one of highlights of Chicago TARDIS ever, I met the lovely Elisabeth Sladen. I know I've told this story twice already on the podcast, but I will always remember how she complimented me on my Jon Pertwee look and asked me if I was wearing this to the "masquerade". I joked that this is how I always dressed (which is halfway true because this also doubles as my usual garb when going to Nocturna), and she playfully slapped my hand and said, "Oh, you Americans, I never know whenever your joking." Very sweet. For various reasons, mostly financial, I did not return to Chicago TARDIS until last year, and this time I dove right in. I participated in several panel discussions on the Friday. I had not attended, let alone done, individual panels before, and in many ways they were the best part of the convention, because I got to speak one-on-one with many fans from all over the country. One of the panels I attended was the podcasters panel, and after listening to the podcasters tell of how they started, it was enough of a spark needed for me to start my own podcast. So this year I'm looking forward to diving head first again for the grand celebration of Doctor Who's 50th Anniversary and meeting all of you listeners that will also be in attendance.